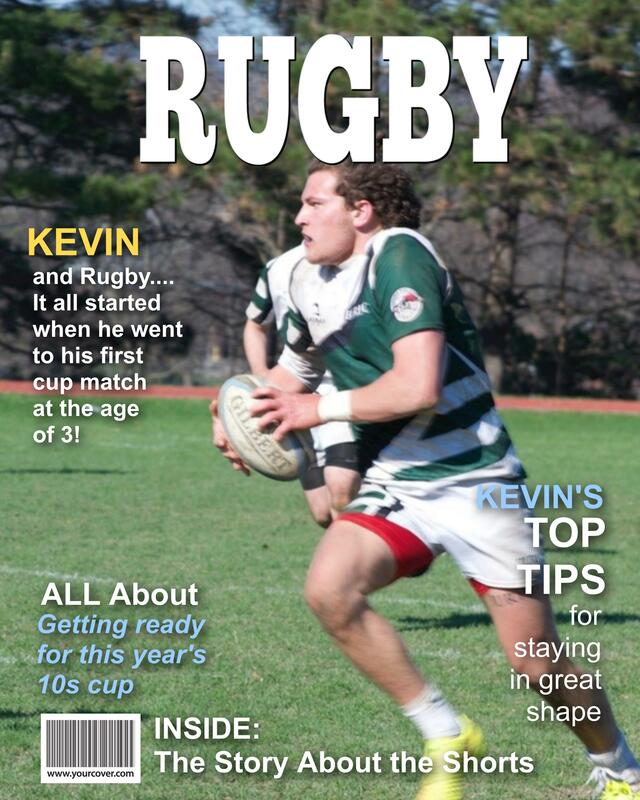 Create a Rugby personalized magazine cover in minutes. Great photo gift or keepsake for anyone who plays rugby, team members, coaches or rugby fans. Use your photo and customize the headlines for a unique rugby gift. Need a unique gift for someone who LOVES the game of rugby, plays rugby or coaches rugby? Or perhaps you want to celebrate the end of a great season with a unique team gift? Whether you are looking for a unique birthday gift or a personalized rugby gift for any other reason, a fake magazine cover that features a photo of the team or rugby player is a unique rugby gift that will be kept forever. Use the YourCover magazine cover generator to customize headlines of the “Rugby” magazine cover template to reflect the likes and dislikes and special rugby memories of the person (or team) starring on the front cover. Choose from our wide variety of headlines so that when completed your personalized rugby gift will be a special memento that celebrates the success of the team or one particular player on the field and over the course of a memorable season. Our one-of-a-kind back cover feature allows you to add a special message to this unique rugby gift, for example you could add statistics from the season or mention the team members or send wishes for a happy birthday. There is also room for additional photos of the team or athlete in action. For those who would like to create a magazine cover to give as a gift for each member of the rugby team (or perhaps to give to the coach or graduating students or outstanding performers), one of the great features of YourCover is the duplication feature. Create your first Rugby magazine cover with custom information about your team; add the first team member’s photo and the specific information about their season on the team. “Duplicate” the fake magazine cover by clicking on that feature button in the My Covers area of your account, the cover is duplicated and all the team info stays the same and you only have to add the new photo and team member’s name and their specific performance information. Each team member’s gift is unique and distinctive yet maintains a theme centered around your rugby team. Our purchasing options allow you to decide which of our personalized magazine cover products best fulfills how you need to receive your rugby gift. You can choose a downloadable photo file to print yourself, or let us print and frame your personalized rugby gift for you. Rush shipping and international shipping are also available as well as a gift service and variety of frames, mugs, posters, and other accessories. When searching for a unique rugby gift or team gift, create and personalize a fake magazine cover. You’ll be giving a personalized rugby gift that’s as special as the athlete starring on the front cover.